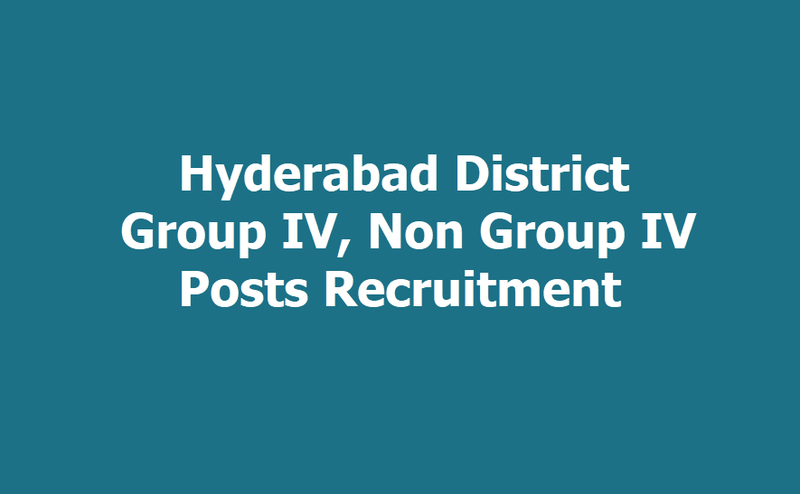 Hyderabad district Group IV, Non Group IV Posts 2019 Recruitment, Group 4, class 4 posts in Hyderabad district. Government of Telangana State, Collector's Office, Hyderabad District has issued recruitment notification and applications are invited from the eligible and interested candidates for recruitment of Group IV and Class IV posts in Hyderabad Collector's office. Notification details as follows. Govt. of Telangana, Hyderabad Dist. Special Recruitment Drive Last date is 5.03.2019. Notification for filling up of the posts under the purview of District Selection Committee (Group-IV) Services- Clerical Cadre) and other than District Selection Committee (Class IV Posts) in Sub-ordinate offices for Backlog Vacancies reserved for persons with disabilities. Qualification: 5th, 7th, 10th Class, Inter, Certificate, Bachelors Degree, B.Ed., Typewriting. Age limit: 18 to 44 years. Candidates should have age between 18 to 44 years. How to apply: Filled in applications should be submitted along with relevant Xerox copies of documents in the Office of the Assistant Director, Welfare of Disables and Sr Citizens, M4, Near Ajanta Gate, Nampally, Hyderabad. Last date to apply: 15.03.2019. Clearly mentioning the name of the post applied for and placing the filled in applications in sealed cover with required proof of documents in the specified proforma given in the annexure for limited appointment of Group-IV and other than Group-IV/Class IV Backlog posts should be submitted on the specified date i.e., 15.03.2019 before 5.00 pm by Registered post in the name of District collector, Hyderabad or can be dropped in the Drop box kept in the District collector's office personally. Applications received after the scheduled date will not be accepted under any circumstances.